Mountain Spirit Winery is a boutique winery whose unique wines have won numerous national and international wine competitions. 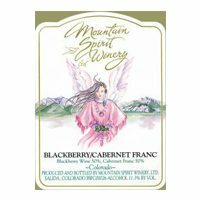 They offer many blends available nowhere else in the world – Blackberry Chardonnay, Merlot/Raspberry, Blackberry Cabernet Franc (a blend of Viognier and Chardonnay). The winery is nestled on five acres of high country in the Upper Arkansas River Valley surrounded by 14,000-foot mountain vistas. The gallery/tasting room is now in its exciting new location next to the Twisted Cork Cafe (Riverside Patio Dining) on West U.S. Highway 50, one block west of Walmart. Sample the wines and enjoy the art. Come for an unforgettable taste extravaganza.A boutique winery whose unique blends have won numerous national and international wine competitions. We offer many blends available nowhere else in the world. Come for an unforgettable taste extravaganza. We are located 9 miles west of Salida, Colorado on County Road 220 (mileage calculated from the Visitor Center/Pool on US 50). Take Highway 50 west from Salida for 5 miles to the intersection of Highway 50 and Highway 285 at Poncha Springs. Continue on Highway 50 west for another 4 miles to County Road 220. Take this exit on your left to the bottom of the hill. Turn left (east) and the Winery is on your right. We have a blue metal roof just behind the old apple orchard.